Shad: The shad run is in full swing. I’ve fished the Potomac around Fletcher’s Cove and Chain Bridge twice now and found shad in good numbers both times. Joe Yack is reporting shad in the Susquehanna now as well. 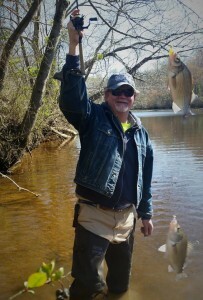 The good news is that hickory shad are running big this year. I’ve seen at least two reports of hicks approaching five pounds. Some anglers mistakenly identify bigger hickory shad as white (American) shad because, when they are fully mature, they lose the spots on their shoulders. The key to identifying shad is to look at the lower jaw. If the lower jaw projects beyond the upper one with the mouth closed, it’s a hickory. I typically cast one-quarter or one-eighth ounce shad darts. It pays to experiment when you’re shad fishing because the same colors and techniques that work one day might not work the next. Last week, my fishing buddy Jay Yesker out-fished me by snap-jigging two quarter-ounce darts on eight-pound-test monofilament. (That’s Jay’s boys in the picture.) The fish were taking on the fall. Since my usual spinning rig is eight-pound-test braid with a similar size fluorocarbon leader, I couldn’t duplicate what he was doing because the force of the snap using the stretchless braid would break my leader. You can bet I was rigged with mono the next time I went out, but wouldn’t you know it, on that day the fish wanted a steady fast retrieve! You just don’t know until you go. The shad run should last for several more weeks, so there’s still plenty of time to get in on the action. Crappie: I’ve only targeted crappie a couple of times this spring, but they are there to be caught. 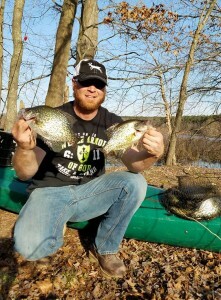 My buddy Carl Ward is one of the better crappie fishermen in the region. He’s been wearing them out in the ponds and creeks on the Eastern Shore. So is Jay Yesker pictured here. Crappie typically spawn once the water temperature gets into the 60s, but they stage in their spawning areas all through the spring. They build nests in gravel or sand near areas of heavy cover like treefalls or bushes. I like to fish for them with a float and fly, but they can also be caught with other panfishing techniques including the old tried-and-true method of drowning minnows. Check out this video for my TOP SECRET float and fly method. I expect to catch more crappie over the next couple of weeks if I can find time to target them. Catfish: I haven’t targeted catfish, but I’ve caught a few. 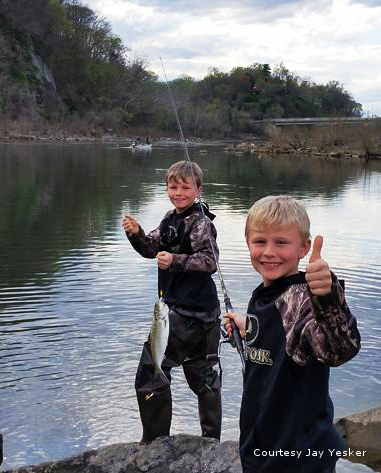 There are so many blue catfish in the Potomac River now that you can’t help but catch them. I’ve seen some very nice cats caught accidentally on shad darts this year. Anglers who are targeting them are doing very well. Jon Griffiths took his young son night fishing last week and caught blue cats up to sixty pounds near Fletcher’s Cove. The CCA Central Region Chapter recently held a blue catfish tournament. Steve Fogle won the boat division with a total weight of 51.18 pounds. Snakeheads: Is Eastern Shore snakehead fishing a thing? Indeed it is. Up until a few years ago most of the snakehead fishing took place in tidal tributaries of the Potomac like Mattawoman Creek. 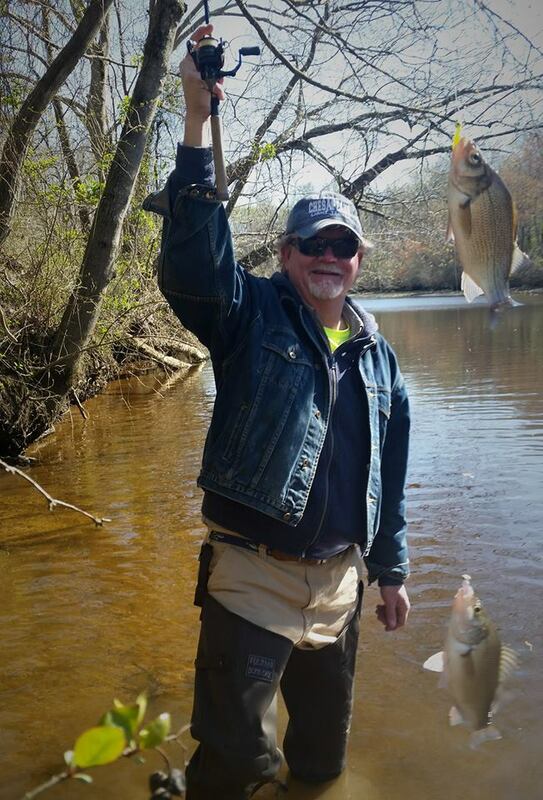 Now, the fish are prolific in Eastern Shore rivers as well. While snakehead experts like Joe Bruce target them with artificial lures, the local Shore fishermen are catching them on minnows under floats. Snakeheads are showing up in good numbers in almost all the lower Eastern Shore rivers and, as Carl Ward reports, especially in the Upper Nanticoke and Transquaking. Current thinking is that they spawn in June and July but many fishermen believe they spawn earlier than that, maybe even as early as April. There’s no doubt that more are being caught this spring on the Eastern Shore than ever before. Rockfish: Things are looking up. 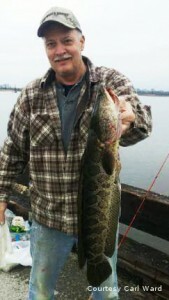 Nice stripers are being caught from shore in the rivers on both sides of the Bay now. The warm water discharges are still holding fish with the power plants in the Patapsco turning out better numbers than areas farther south. While fish can be caught near Baltimore Harbor by casting, a few guys are trolling umbrella rigs behind kayaks and picking off a fish here and there. There has been some very nice rockfish caught in the headwaters of the Potomac this week, and the Susquehanna River above the I-95 bridge is producing as well. The Susquehanna Flats area has been good, but not great as the fishing there is significantly influenced by weather conditions and water clarity. Until recently, I’ve kept my boat at Taylor’s Island Campground, but I’m now fishing back closer to home and launching off Kent Island. Our best day jigging on Thunder Road so far this year has been nine fish over forty-inches, but on most trips we’ve just caught one or two big fish. 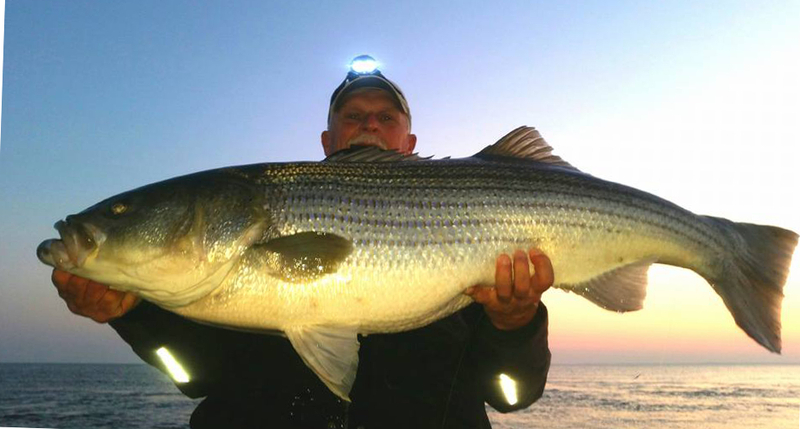 Not to be left out, planer board trollers are bringing in some trophy stripers this week with the most productive areas being the south side of Kent Island and the channel edges below the mouth of the Choptank. So that’s my report. Catching is good no matter where you live, what you like to target, or how you like to fish. I hope you can get out and get in on this April smorgasbord of good fishing. Now is the time to eat at it up! Great report Shawn. Thank you. I always look forward to your reports. Nine fish over forty, now ,that is a great day. Excellent info as always, Shawn. Hey Capt. Kimbro – the fish finder was showing 61-62 degrees in the creeks this week. Does that mean it’s Topwater O’clock? Yes indeed. By this weekend it should be good in all the rivers. There were some fish caught on topwater in the Susquehanna Flats and Ebay yesterday and this morning. Rock the rockfish! 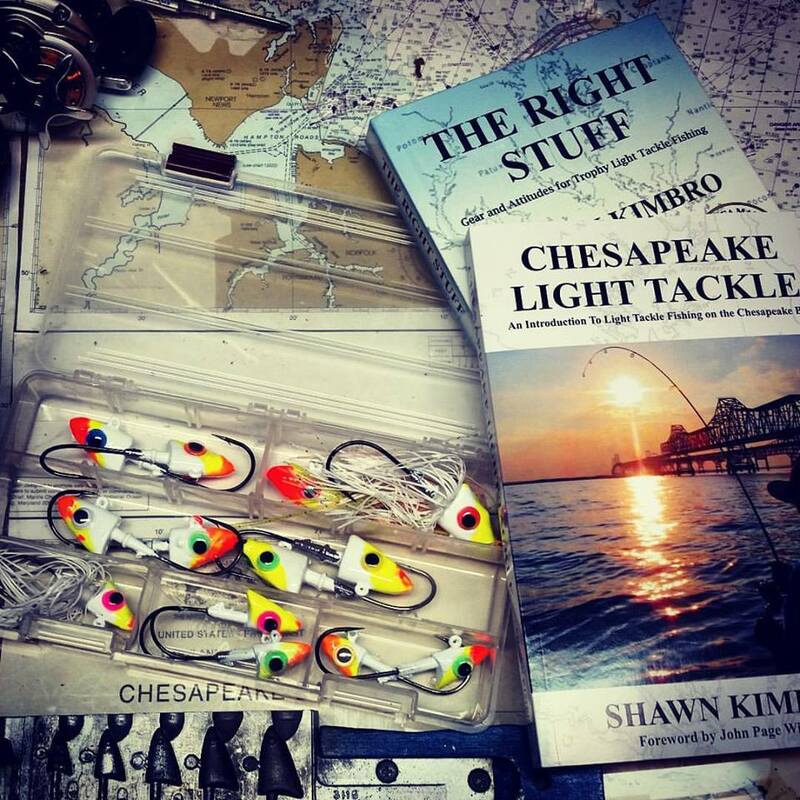 Another fine read Shawn… Covering the various bites from the Potomac to the Susquehanna is a daunting task! Good stuff my friend. Hi Shawn, Great stuff. I truly enjoy your fishing reports as you always provide really good information regarding fishing the bay. I have to ask…the last picture on this report (the one with the Angler holding a monster Rockfish and he is wearing a headlamp), is the Angler pictured Rich Jenkins? 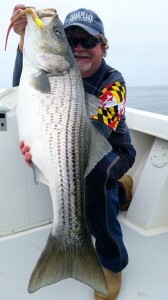 Yes, that’s Coach Jenkins with yet another monster rockfish!